In CityBeat’s recent Food Issue, I wrote about Brandt Beef, an Imperial Valley operation that offers high-end, restaurant-quality beef at a number of San Diego-area farmers markets. “I have tasted none better,” I wrote. But what do you do with beef as good as Brandt’s prime steaks? In my book there’s no better way to feature a high-quality steak than to cook it sous-vide. French for “under vacuum,” sous-vide is a method of cooking in which food is sealed in airtight plastic bags and placed in a water bath at an accurately regulated temperature, lower than normally used (temperatures for beef would be between 131° and 140° Fahrenheit). The idea is to cook the item evenly, not overcook the outside and keep the inside at the same level of “doneness,” thus keeping the food juicier. For steaks, caramelization (the Maillard reaction) is achieved by a quick sear or grill after the meat comes out of the water bath. Steak cooked sous-vide and seared appears more rare inside than it actually is. It ends up all being the good stuff. 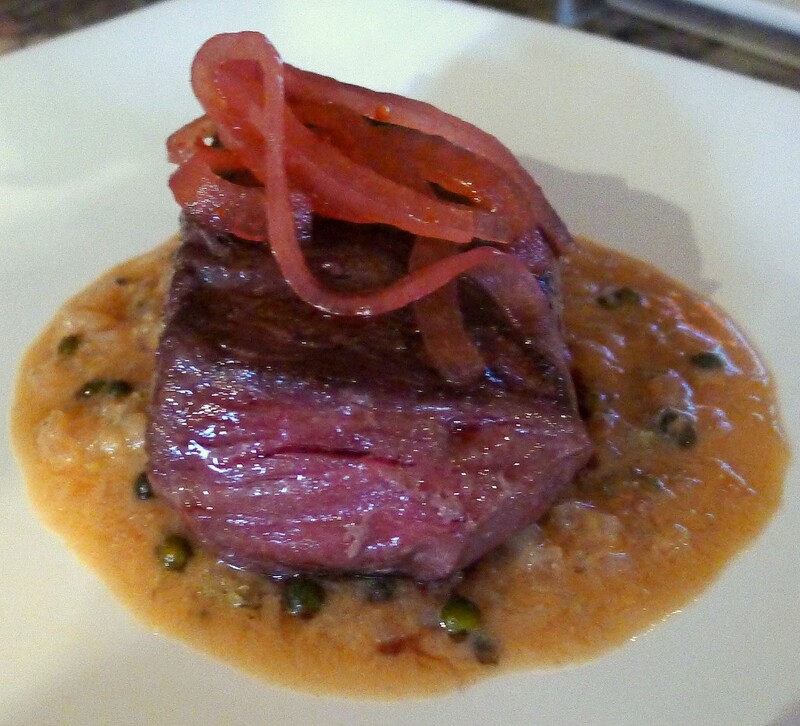 Here, I sous-vide and grill Brandt Beef’s Bavette Steaks (sirloin tip) with pink pickled onions and a mustardy version of a classic green peppercorn sauce. 1. Make the pickled onions. Place the onion slices in a metal bowl and cover with boiling water for one minute before draining. Place the remaining ingredients in a saucepan and bring to a boil. Add the sliced onions to the saucepan and let stand for one to two hours. Store in a refrigerator. Cook the steaks in the sous-vide. Meanwhile, season each steak liberally with kosher salt and freshly ground pepper. Place two steaks in each food-grade plastic bag and vacuum seal (if you don’t have a vacuum sealer, try this method using Ziploc bags). Using a sous-vide machine, waterbath or a pot of water and a thermometer, bring the waterbath to 132° Fahrenheit. Cook the steaks for one hour at that temperature. 3. Make the green peppercorn sauce. Add 1 tablespoon of grapeseed oil and the shallots to a medium saucepan and sweat over low flame until they are translucent, three to five minutes.Add the green peppercorns and brandy and cook until the liquid reduces almost completely. Stir in the mustard, lemon juice, lemon zest and Worcestershire sauce. Swirl the pan so all of the flavors start to meld together. Add the beef stock and reduce to a desirable consistency, then stir in the thyme. 4. “Grill” the steaks. 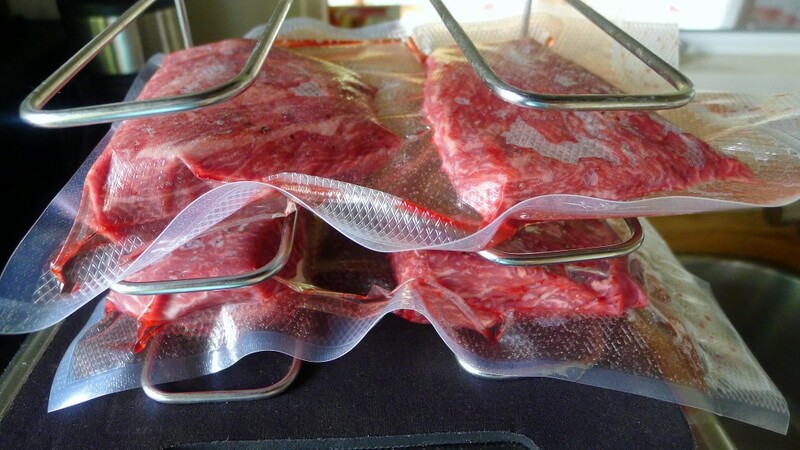 Remove the steaks from the sous-vide and from the bags. Heat a heavy grill pan over high flame and sear the steaks on both sides until they are nicely caramelized, about two minutes per side. Remove the steaks from the pan and allow them to rest. 5. Plate the dish. Pour a pool of the green peppercorn sauce in the middle of each plate. Top each pool of sauce with a steak. Crown each steak with some pink pickled onions.